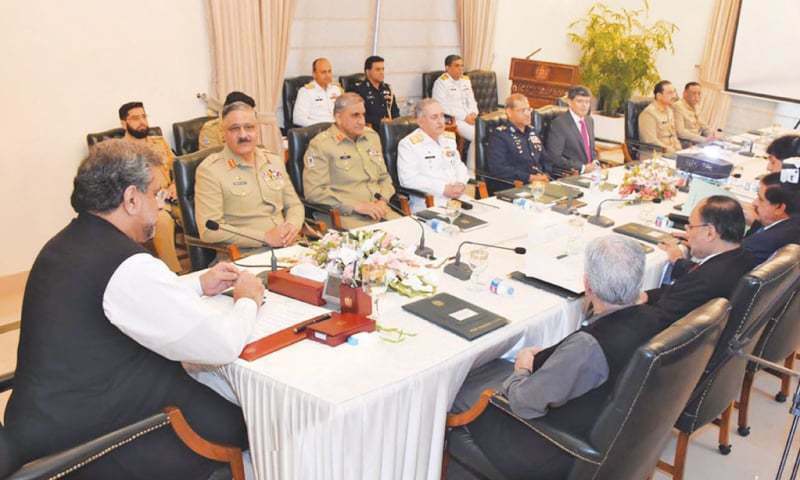 ISLAMABAD: A day after the military’s top brass reviewed the “geo-strategic and security environment” in the context of US policy on the region, the Parliamentary Committee on National Security (PCNS) went into a session on Thursday to receive briefing from officials of the defence and foreign affairs ministries on US-Pakistan ties. The head of the committee, National Assembly Speaker Sardar Ayaz Sadiq, who in the past had informed reporters about discussions taken place during the in-camera meetings, on Thursday refused to give any media briefing due to the amendment to the rules recently passed by the Senate providing for punishment to the members found guilty of leaking out details of in-camera proceedings of the house. When the members of the committee came out after attending over three-hour-long meeting, they also refused to divulge any detail of the session to reporters, saying that the speaker might give a briefing. However, the speaker used another corridor to reach his chamber to avoid any interaction with the media. Later, the speaker during a brief and informal chat with reporters simply said that the main purpose of calling the meeting of the PCNS was to review the overall situation in the country and the region in the wake of recent challenges to national security. The speaker simply responded in the affirmative when asked if the relations between Islamabad and Washington had improved after the controversial anti-Pakistan tweet by US President Donald Trump. He said they had been told that the situation had improved. When asked if the committee members were satisfied with the briefing, Mr Sadiq said that no one had expressed any reservation. Prominent among those who attended the meeting were Leader of the Opposition in the National Assembly Syed Khursheed Shah, Pakistan Peoples Party parliamentary leader Syed Naveed Qamar, vice chairman of the Pakistan Tehreek-i-Insaf Shah Mehmood Qureshi, Pakhtunkhwa Milli Awami Party chief Mehmood Khan Achakzai, Jamiat Ulema-i-Islam-Fazl chief Maulana Fazlur Rehman, Ilyas Bilour and Ghulam Ahmed Bilour of the Awami National Party. Foreign Minister Khawaja Asif, Defence Minister Khurram Dastagir and National Security Adviser Nasser Janjua also attended the meeting besides the secretaries of the ministries of foreign affairs, defence and interior and Director-General Military Operations Maj Gen Sahir Shamshad Mirza. One of the participants told Dawn that the focus of the meeting was Pakistan-US relations. He said internal situation in Afghanistan and alleged interference of India in Kabul also came under discussion. However, he added, there was no India-specific issue on the agenda of the meeting. Last month, the Senate had unanimously approved an amendment to its rules of procedure and conduct of business to provide for punishment to the members found guilty of leaking out details of in-camera proceedings of the house. It is interesting to note that the Senate’s amended rule is applicable to the members of the upper house and not to the parliamentary committee constituted by the speaker under the National Assembly’s own rules. Senate Chairman Raza Rabbani had observed that the passage of the amendment was a legal requirement as a committee of ethics had come into being and it had legal justification or resources to take action against those who acted irresponsibly. Mr Rabbani had made it clear that it had nothing to do with Army Chief Gen Qamar Javed Bajwa’s visit to the house to attend an in-camera session of the committee of the whole house, but it had been going on for a long time even when he (Gen Bajwa) was not holding the present position. The rule was amended a month after the army chief’s appearance in the Senate Committee of the Whole for a briefing on the regional security situation and despite the in-camera session, the media reported almost every detail of the proceedings. Some of the senators even discussed the proceedings on camera. The Senate chairman had expressed his annoyance over the media coverage of the in-camera proceedings and the conduct of some of the senators.